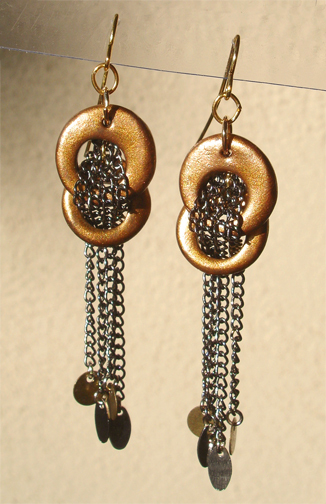 These earrings were constructed out of several components. First I sculpted two hoop shapes in polymer clay and finished them with some metallic powder. Once again I harvested parts from necklaces and other jewelry that I take apart and reuse. This time I chose fine chains and some tiny round and oval charms. I attached the bottom gold hoop and the chains to a jump ring on the back of the top loop. Once attached to the back, the chains were gathered and threaded through the hole in the bottom hoop to weave the two hoops together. There are a lot of textures and a lot of movement to these earrings, and I can see a lot of potential for variations on this basic design. Hey, that’s pretty cool, Pammy! I’ll bet Cristina would dig those. I really like the warm metalic colors. Thanks, Frankie! Yeah, those metallic powders are the best!